It’s been a while since we’ve posted a publication update, but that’s not to say Rimba’s researchers haven’t been publishing! 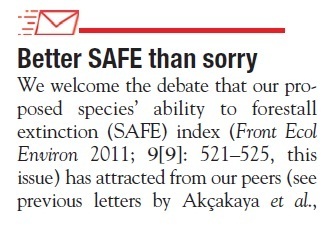 In this update, we’re featuring a letter published two months ago in the journal Frontiers in Ecology and the Environment. Led by Prof. Corey Bradshaw with three other co-authors including Reuben, this letter was written in response to several critics of the SAFE index. The SAFE index was proposed by the same four scientists to help us address, with some scientific basis, two commonly encountered questions in the field of conservation: 1) How far is species X from extinction? 2) If we had limited resources, should we invest our resources in trying to save species X or Y? As the introduction to the letter states, debates surrounding new concepts are always healthy in science. If you’re interested in finding out why people were not happy with the index, and why Bradshaw et al. felt their fuss wasn’t all that warranted, you can download the paper here. Project update 8: Two Wildlife Corridor Projects!